Even though both of those terms are actually standard measurements of a specific quantity, they’re also used individually and together to mean “a lot”. That’s the meaning I’m intending – just in case you wondered. They’re the kind of words you’d hear a lot on the farm, like maybe in a Farmhouse. We love this a bushel and a peck – Farmhouse by Fig Tree. This is a pre-Market collection. That means that in the olden-days – a couple of years ago – most new collections used to debut at Quilt Market, but now an equal number are published in the catalog that comes the month before. Pre-Market collections will ship in August and September while Market collections will be available in October and November. At least that’s always the plan. Do you remember the stack of “flippers” – capsets / headers – I showed a few weeks ago? On the left, from top to bottom – Hawthorne Ridge by Jan Patek / Chic Neutrals by Amy Ellis / Alice’s Scrapbag by Barbara Brackman / Farmhouse by Fig Tree Quilts / Kindred Spirits by Bunny Hill / Polka Dots & Paisleys by Minick & Simpson. On the right, from the top – Nocturne by Janet Clare / Meadowbloom by April Rosenthal / Hello Darling by Bonnie & Camille / Varsity by Sweetwater / For You by Zen Chic / Collection for a Cause Nurture by Howard Marcus. 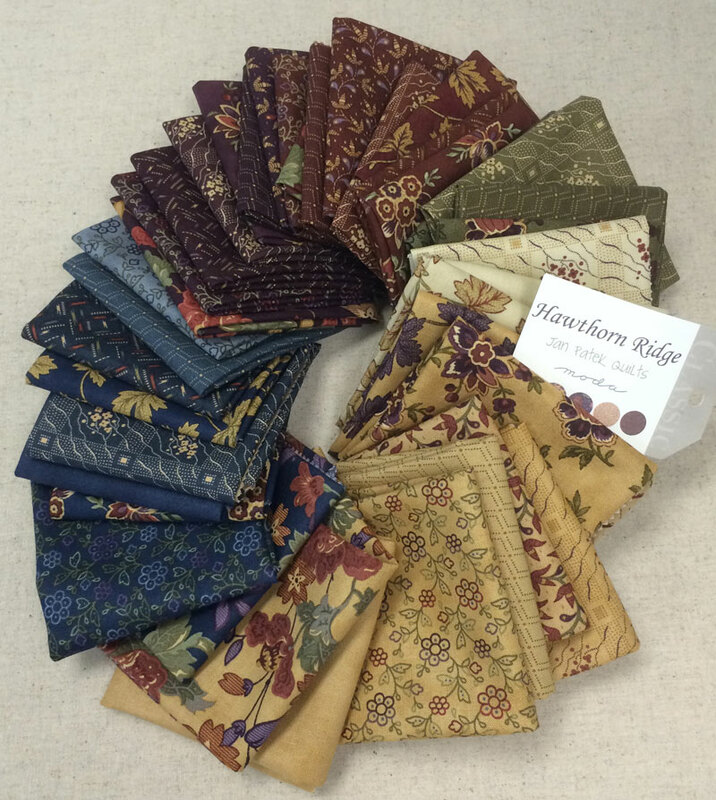 “Pre-Market” is also a big buzz-word around the office these days as there is lots of pre-Market sewing going on right now – specifically, the sewing of quilts made with the pre-Market collections. Confusing, right? You’re not alone. It gets worse. Or better. Depending on your perspective. 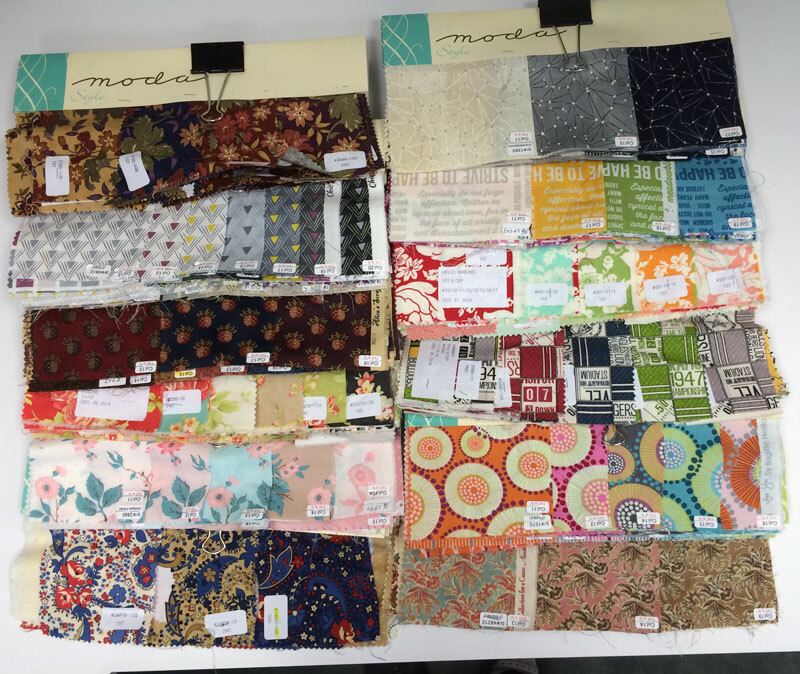 Sample yardage arrives in two forms – actual yardage that is rolled onto bolts and cut for borders, bindings, big pieces, etc., and the usual assortment of pre-cuts. Sometimes those two things come in at the same time and sometimes they don’t. For some collections, the arrivals aren’t even close – we’ve had the yardage of one collection for over a month and the pre-cuts still haven’t arrived. (BAAP!) (That’s a “bushel and a peck”.) At last count, “we” are making more than 20 sample quilts in different sizes and using different collections. Some are original in-house designs and some are duplicates of quilts made by the designers that will be used for various events and trunk shows. This is where we really do need a bushel and a peck – of people. Everyone in the company who knows how to sew pitches in and volunteers to make quilts. And friends – they help too. Right now, off the top of my head, I can name fourteen people who I know are making samples – and I’m sure I’m forgetting a few. Sometime before or after Market, I’ll show you all of the quilts that were made and tell you who made them and who quilted them. Yes, that’s the other big group of people we rely on, the talented folks who machine-quilt the quilts. And there will be more quilts to make when the Market collections arrive. To improve our efficiency and ability to quickly make samples and other business-related items, we have added a new machine to the office. At least that’s the official line anyway. 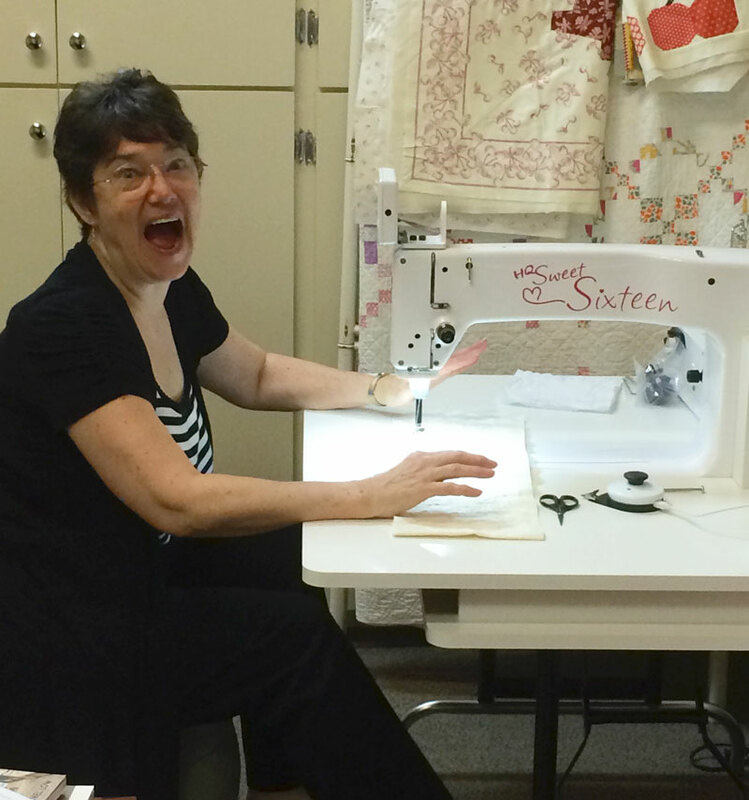 It will probably accomplish those goals when we learn how to use it – we got a Handi-Quilter Sweet Sixteen. It’s in Tammy’s office – she has the space and she’s the only one who already knows how to use it. The balance ball “chair” is not required but Tammy likes it. Me? I’m more afraid of sitting on that ball than using the machine – I just know I’ll forget that I’m sitting on a ball and wind up on my head before I remember. Of course that didn’t stop me from telling Tammy that I’d heard that “the bosses” are expecting her to be ready to quilt all the sample quilts by Fall Market. Given the velocity and accuracy with which she threw that big ball at me, the Texas Rangers ought to consider signing Tammy to a pitching contract. But not until after Quilt Market, she’s still got a sample or two to finish. You are so fun, Carrie! I know the Moda team loves having you in the office! I enjoyed reading your “Bushel and a Peck” comments. I sing a “BAAP” song to my 5 yr old several times a day and he sings it back to me….”I love you, a Bushel and a peck, a Bushel and a peck and a hug around the neck!” There is more to it than that but that is the part we sing all the time. (I think it was made famous by Doris Day? Also includes a Barrel and a Heap….) Yes, we live on a farm, and yes, I LOVE Joanna’s new Farmhouse collection. Have fun sewing all those samples. I’d love to be helping out with those—-sounds like my kind of excitement! It’s one of the songs from the musical “Guys and Dolls”. Carrie-your posts always make me laugh! Thanks for the early peek at the new fabric lines. Love these lines. Nice to see some ‘manly’ fabrics for a ‘manly’ quilt. Not too sure about trying the ball thing. who would pick me up? Thanks for the sneak preview! Love the new fabrics, so fresh, such a variety of color and pattern. There’s always a degree of anticipation(a high degree actually) when one is waiting to see new fabric lines. Thank you for sharing. I’m telling myself that I do not need more fabric. Hah! Moda, you’ve outdone yourself. What a great job you have – I’ve been enjoying your posts! I enjoy how you write and the humor. 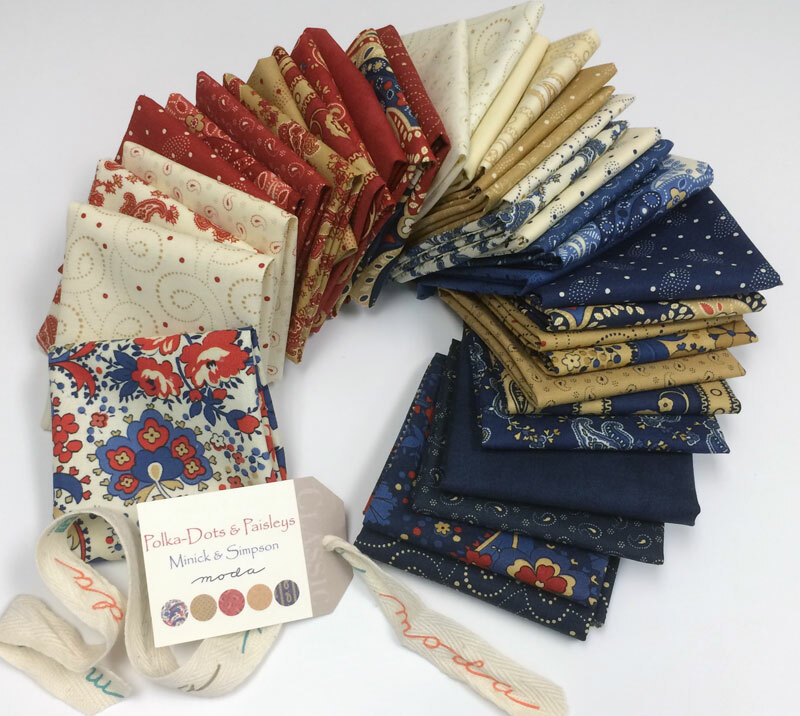 Not too long ago you posted something about Bonnie and Camille’s fabrics and the new one coming out “something Darling” and it’ll go great with the Christmas line they will have coming out. Would it be possible for you to send me that posting again? Thank you! Carrie, It’s SO good to see your blog in my in-box! The move seems to be wonderful for you and your funny and inspirational writing lightens my days! Just wanted you to know:) And Thank You to Mr. Dunn as well, and All the other Moda folks who had a part in getting you there! You write a good blog, intertwining as well as informative. Thanks for the sneak peek of fabrics. I would really like to read about how you all like the the quilting machine as I have been considering purchasing one. I look forward to your next post. Me ha encantado tu “post” sigo sonriendo.Gracias. Las telas son muy bonitas. Gracias, Rosa. Puedo hablar y leer un poco de español, y necesito la práctica. Me alegro que te guste las telas nuevas, son muy bonitas. I would be glad to help with this undertaking! Just send a BAAP my way and BOOM it will be taken into my creative hands and something beautiful will happen. The song bushel and a peck is from the musical Oklahoma! i think…! Isn’t it the same musical as bright golden hase on the meadow? Great information. Love learning about Moda staff too. Hi to Tammy. I love you a BAAP is a song I sung to my children, grandchildren and great grandchildren. Thank you Carrie for another great post. Holy Scamoly (as my daughter would say) that is a lot of fabric!! So fun at this end of the computer, but I bet there are really stressful times! 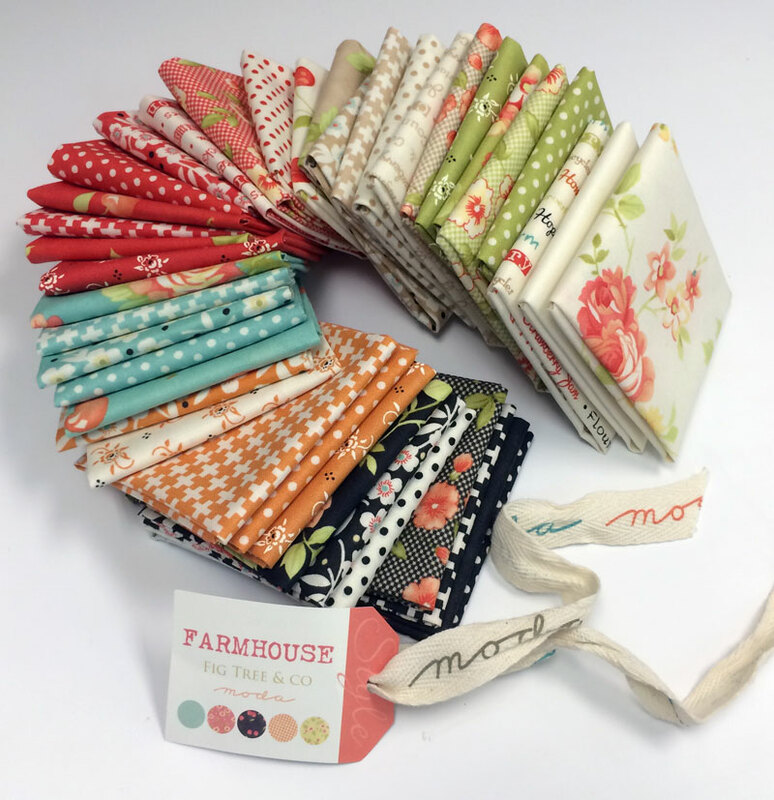 I want all the fabrics you showed Carrie….and not just a bushel and a peck either! But really…do we have to start sewing on an excercise ball now? I know it’s for balance…..but it’s a ball (nightmarish flashbacks to p.e ) and it was designed for excercise. Quilting is for fun! Such fun to see all the fabrics. And we can all budget (haha) better with some lines pre market and some a few months later. As for me, well a number of these are already preordered! now to plan the projects. What fun to do some market sewing, will look forward to that post too. Or as I tell my babies “How much do I love you? A bushel and a peck and a hug around the neck”. And that’s also how much I want one of those Sweet 16 machines! I love your posts…I look for you every day! As a “newbie” I can’t believe what I have been missing. Your current post (and older ones) are so informative and FUN. The fabrics posted are beautiful and I am looking forward to adding to my Stash. Love all the new eyecandy fabric collection pictures! Hello Darling is my favroite, of course, (is it just me or do you also have this picture in your head that some great diva like Marilyn Monroe is saying ‘Hello Darling’ while answering the phone?) closely followed by Farmhouse. Now I wonder how this two would look together. Especially the reds and greens because it can be tricky to pair these colors. Perhaps you can show us? Please? I hope Tammy gets to keep at least one of the quilts she creates! After quilting on a Juki sewing machine, I really appreciate the work of professionals like Tammy. I’m looking forward to your post showing all of the quilts with their information! Well, isn’t that a Huge Texas size BAAP!!!! All so beautiful – must be mind boggling to absorb it all! I have a few favorites and can’t wait to have some – I hope there’s more than lint in my pockets!! I may have to UNretire and get another job to afford some of these new collections coming out. SERIOUS case of the “wants” for them …. keep up the good work of making my mouth drool whenever you post about a new collection …. OH MY!! Look forward to several of these gorgeous collections! Thank you, Carrie, for entertaining us with your lively musings! wow this collection is amazing ! Call me a math geek but something doesn’t quite compute. I get the binding and batting quantities, but 12 yards of fabric, really? 2 lengths for backing, so maybe four yards there. But even allowing for cutting it up small, are you sure that’s right? Seems like a lot. Or are you hoarding the scraps? LOL! Yes!! The Sweet Sixteen is the best!!! But you MUST have the extension table on each side to help hold your quilts or you’ll have major drag. They can be let down when not in use. I’d love to come help quilt your quilts on that sweet sixteen!!! 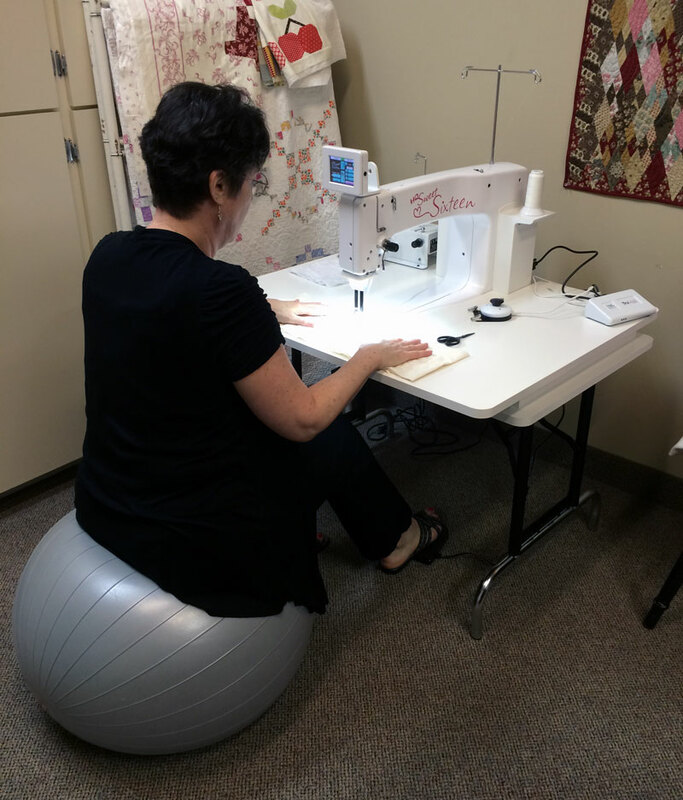 I love the idea of sitting on a yoga ball while you sew! Also the colours in the farmhouse collection are beautiful!